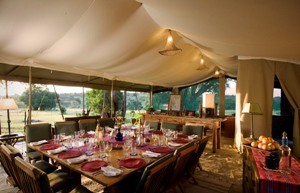 Mara North Conservancy Kicheche Mara Camp is a classic tented camp hidden in a beautiful acacia valley overlooking the Olare Orok stream. 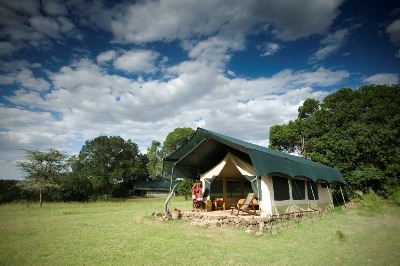 With only 8 tents the intimate and relaxed atmosphere gives you the opportunity to enjoy a unique experience in the prime wildlife area of the Mara North Conservancy. Check-in at Airkenya passenger terminal Wilson Airport one hour before your flight either at 0800hrs‚ 1030hrs and 1400hrs. The flight takes approximately 45 minutes. Touch down in this magnificent wilderness and your guide will be there to greet you before setting out across the plains where you will have your first wildlife sighting enroute to camp. You will then be met by the camp hosts and given a briefing before settling into your tent and freshening up before lunch‚ if you had a morning flight. Afterwards‚ relax and absorb the surroundings before setting off on an afternoon game drive in the conservancy till sunset. You may come across giraffe nibbling on the highest leaves or elephant stripping bark from the tastiest trees. Return to camp at dusk for hot showers‚ then an aperitif by the fireside with your hosts and other guests before settling down for dinner. 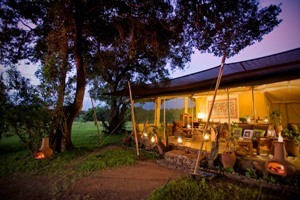 Rise early with tea or coffee brought to your tent then set off fas the sun rises for a wilderness awakening game drive. The verdant plains host a fabulous array of plains game such as gazelles‚ impala‚ buffalo‚ zebra‚ wildebeest and eland. Never far away are the predators such as lion‚ cheetah‚ leopard and hyena which our guides are finely tuned to finding. Enjoy a picnic breakfast in the most magnificent outdoor setting on the plains before winding your way back to camp. 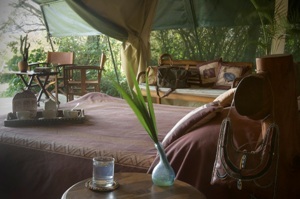 After a leisurely al-fresco lunch back at camp‚ relax‚ read‚ watch the resident birdlife or enjoy a siesta in your tent. Afternoon tea is followed by game driving in another area of the conservancy where you may see jackals roaming‚ warthog bathing or impala jousting. Sundowner drinks are served in a picturesque spot as you watch the sun sink below the horizon. Return to camp to exchange stories around the campfire with the other guests before your mouth watering three course evening meal. Today is an opportunity for a full day outing to explore the further reaches of the Conservancy or‚ if during the migration season‚ the Reserve. Breakfast will be served in camp before setting off with your guide into new terrain. On the menu today you may encounter a cheetah stalk an unsuspecting Thompson gazelle‚ watch hippo bathe alongside crocodile in the river or watch a territorial wildebeest chase off his rivals. Pull up at a shaded spot and watch as your picnic lunch unfolds before you. In the afternoon continue traversing the magnificent terrain and witness the never ending interactions on the plains. You may finish the day watching the fascinating interactions of one of our lion prides with lionesses lolling about‚ cubs playing and the malesemitting thunderous roars. Today you may wish to enjoy an escorted game walk from camp where our interpretive guides will point out the spoor of a leopard‚ the nest of a rare bird or signs of recent migration activity that would pass unnoticed by the eyes of strangers. After breakfast back at camp the team will bade you farewell as we transfer you on your final journey across the plains to the airstrip for your flight back to Nairobi. Child Policy: Rate applies to children btween 2 and 11 years. Airkenya terms and conditions apply. Send an email to safaripackages@airkenya.com to reconfirm your booking.The booking reference number must be indicated.